Learn traditional astrology from the ground up with this first program in a new series based on Demetra's forthcoming workbook Traditional Astrology for Yourself. 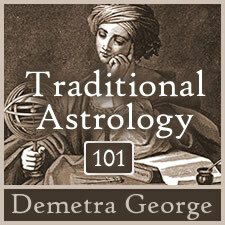 Demetra explains how to easily incorporate traditional astrology techniques into a modern astrological practice. She begins with a brief over view of the history and context of traditional astrology and then introduces the foundational techniques including sect, a deeper understanding of malefic and benefic planets, the first two of four systems of rulership (domicile and exaltation), houses (including meaning, strength, and favorability), aspects, solar and lunar considerations. 6 hours. Recorded in August 2011. mp3 format.